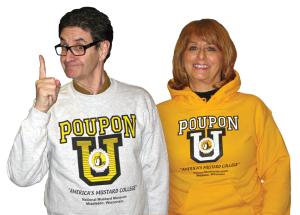 Last week we put our POUPON U sweatshirts on sale but only so long as the temperature here in Middleton fails to reach 45 degrees. We figured that would be just a matter of days. How wrong we were. Temps are supposed to fall to 4 below tomorrow night and the highest we are expected to see will be 41 on Sunday. Will we ever see “balmy” 45??? The sale goes on as we shiver. Grey crew neck sweatshirts are only $25 (reg. $32, PPN500) and yellow hoodies are only $27 (reg. $36, PPN550). This entry was posted in The Curator's Curiosities. Bookmark the permalink. Looking for a mustard that was given to me a long, long time ago. It went under the name of Progressive Bob’s. In contacting the Mustard Museum, I was advised that it is the Curry Mustard Sauce. Well ,I’m ready for more and could not locate it in the pamphlet mailed to me. Is it still available? ?